Step 2 - click the New button. 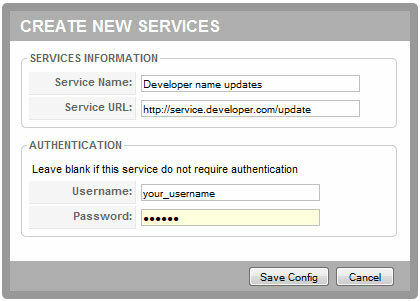 Now a pop-up window will show up so you can configure the new updates service. Type in your account username and password, only if the extension requires. Step 3 - click the Save button to save settings. Usually the component will autodetect settings on installation but moving the website to another server will require updating these settings or in some cases reinstall the component to make sure these settings are perfect. In this panel you can manage versions stored for the extensions you have upgraded on your live site. Here you can delete complete back-ups or only a few files, but also you can upload more content to the repository. To learn more about htaccess permissions settings, please refer to this resource.